A Fast, Non-Contact Game of Skill and Strategy .Players score points by throwing the ball at the rebound net in such a manner that it cannot be caught by the other team before it hits the ground.Teams use quick passes and thinking to advance the ball down the court.Includes 2 folding rebound nets (39" x 39"), 1 official ball, handbook, laminated rules and instructional DVD. . 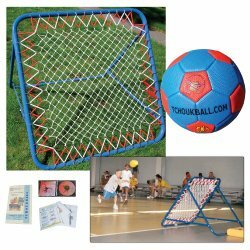 If you have any questions about this product by Tchoukball, contact us by completing and submitting the form below. If you are looking for a specif part number, please include it with your message.